In a biopic heavy cinema season, great men and their stories have been immortalised on film, their strengths and achievements never to be forgotten. Based on the memoir ‘Travelling to Infinity: My Life with Stephen’ by Jane Wilde Hawking, director James Marsh documents the tragic, yet triumphant life of British physicist Stephen Hawking. 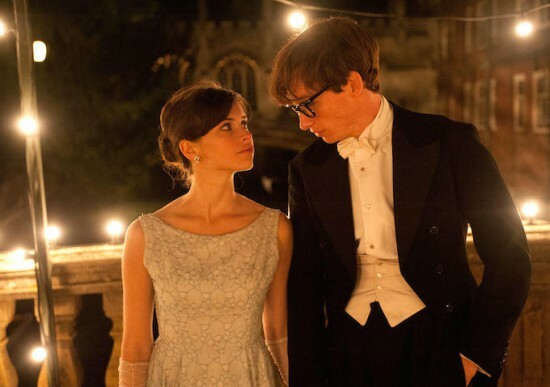 With a hugely impressive central performance from Eddie Redmayne, the film tracks Hawking’s life from his complex marriage to Jane (Felicity Jones) to his scientific accomplishments. When studying at Cambridge University, he was diagnosed with motor neuron disease and given a mere two years to live. Despite his sense crippling illness, he persevered to subsist, his fulfilled existence defying the odds and making him one of the, if not the most decorated scientist of his generation, specialising in cosmology and writing a best-selling book ‘A Brief History of Time’. The narrative moves surprisingly quickly through the stages of Hawking’s life and the deterioration of his senses, and uses montage as a technique to almost gloss over key events such as his wedding day and the births of his children. I think because so much time passes, there is a lack of focus as to what the film is actually about. Is it about his illness? Is it about his marriage? Because Hawking is such a well known character, the retelling of his story does little more than offer some insight into his personality. With the same restrictions as Hawking himself, Redmayne does a fantastic job at portraying the internal struggle as well as the physical hurdles encountered as a result of his condition. Similarly, Felicity Jones is very good as his long suffering wife. The responsibility of caring for Stephen and of course her unwavering love for him takes its toll on her character as she loses the man she fell for in cruel instalments, and she expresses the range of emotions powerfully and effectively. In coaching superb acting turns from his romantic leads, director James Marsh succeeds and therefore it comes as no surprise that both Redmayne and Jones have been recognised with nominations for their suitably nuanced performances at the forthcoming awards ceremonies, both doing their counterparts justice throughout the severe highs and lows. However, the lack of direction in terms of exploration of themes was frustrating, leaving questions unanswered, particularly around the field of science. The subject matter is presented clearly, openly and honestly, but unfortunately doesn’t show all of the working. ‘The Theory of Everything’ is the study of nothing. This entry was posted in DVD and tagged eddie redmayne, felicity jones, james marsh, stephen hawking, the theory of everything. Bookmark the permalink.